Cookie Gift Programs for Birthday and Anniversaries! Build customer or employee loyalty with fresh-baked treats. Each custom cookie gift comes with a complementary stock card. Custom cards to match your tin are also available at a nominal fee. You send us your list and we take care of the rest!! Select a Fresh-baked cookie gift or custom cookie assortment from: Gourmet Chocolate Chip Cookies, Summertime Assortment, Heatwave Assortment or Snack Attack Assortment - each are recommended for this program and are great to ship all year. No cold packing required. Smaller Tins are also available of each of the above. Gourmet Chocolate Chip Cookies in Mini Tin, Heatwave Mini Assortment, Snack Attack Assortment Mini Tin - Other sizes and assortments are available. Contact us for a custom quote. All orders receive an image proof for review and approval before any charges are made to your credit card. 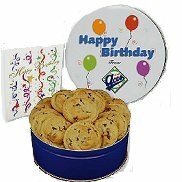 Minimum order is 24 tins per tin size-- All cookie gifts must ship within 12 months of the date your order is placed. If gift list is not sent at the beginning of the program, then the birthday/anniversary list must be provided no later than the 20th of the month, for the following month. 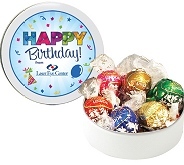 Select our Celebrate Tin without an imprint- for programs where there will be both Anniversary & Birthday shipments OR Select our Birthday Tin with your logo imprint for our Birthday release program. All orders are pre-pay for imprinted tin Lids (Set up fee and Tin Lid Imprint). You will be charged as each fresh baked custom cookie selection (chocolate chip cookies is the most popular) is shipped out for the cookies and shipping/handling. Gifts ship every Monday to all recipients whose event falls in that week. Imprinted Tins Set up fee is $50 - Custom Lid or Logo on stock lid imprint charge per tin is $3.00 ea. **Unused cookie tins are not refunded. They are pre-printed when you place your initial order. Shipping is not included in the shopping cart and will be charged separately at time of shipment. Shipping may be estimated upon request. You may also supply and use your company shipper number to cover shipping of your order as an option, handling fees per box are additional. See General Information for more info.